This photograph shows the cornual (interstitial) pregnancy from a slightly different angle. Since the blood supply to this area of the uterus is enormous, these pregnancies can often become quite large prior to diagnosis. 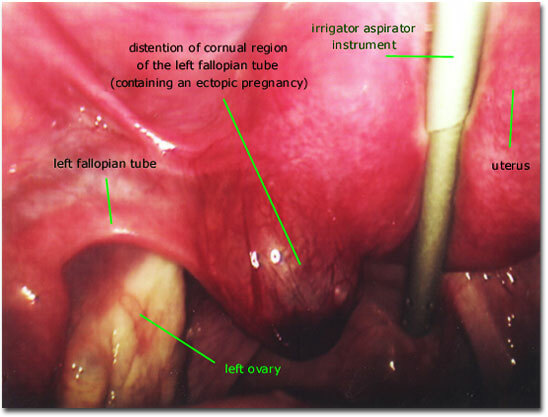 This cornual ectopic pregnancy is relatively small compared to others that I have seen. Great care must be exercised when removing these pregnancies. I did not attempt a laparoscopic removal of this ectopic pregnancy (despite its relatively small size) since meticulous hemostasis is difficult to assure with this approach. At laparotomy, the ectopic pregnancy was removed and the corner of the uterus was carefully repaired without any significant bleeding.